I am on a play food kick lately. It started with the crochet hamburger I did a few weeks back. 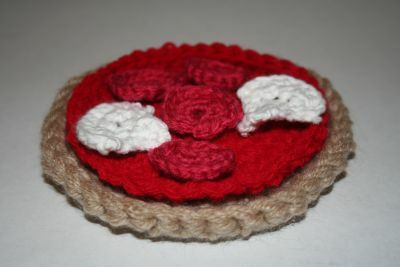 I thought that pizza would make an excellent play crochet food so I set out to whip up a small personal size pizza one evening. I’m going to start jotting down notes when I crochet so that I can make some patterns from my creations. The pizza consists of the dough, sauce, a few mushrooms, and pepperoni. The next pizza will probably be slices that can be put together to make a whole pizza.